Telehealth is the latest upbeat in the healthcare delivery model. Quick, Easy and Reliable. Register today and get your first online physical therapy evaluation. 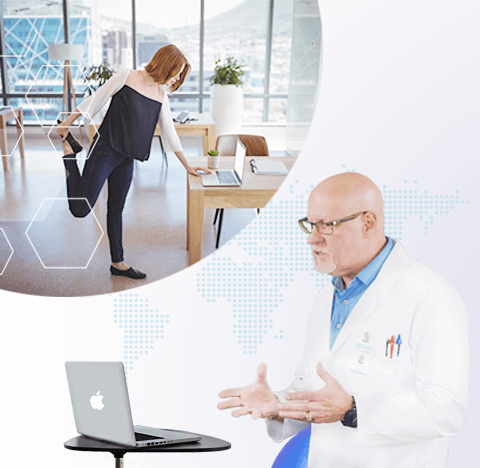 TheraNow has pioneered "Online Physical Therapy" using tele-rehab techniques with private video conferencing via a laptop or smartphone from the comfort of your home or office! TheraNow provides easy-to-use and system compatible 2-way video conferencing that gives a premium and comprehensive online physical therapy consultation experience. We at TheraNow understand that not all doctor-patient interactions happen in real time. Our in-app secure messaging system enables you to exchange relevant information with your doctor. To ensure quality and effective patient care, pre-screening enables our board-certified physical therapist to thoroughly review your medical condition based on the information you provide. Upload the medical documents/reports related to your condition on our encrypted server for your provider's better understanding of the problem and your ease-of-access. Signing up to use TheraNow services is free. Log into your account to book an appointment by selecting your own physical therapist. You only pay when you book an appointment. Patient’s information and privacy is our prime concern, and we have taken all the necessary steps to safeguard you. Our servers utilize bank-grade encryption, compatible with HIPAA standards. *By subscribing, you agree to our T&C and privacy Policies.